This luggage is usually bigger than their body, they are dressed in fashionable journey equipment. It is usually obvious by their appearance that they have visited the latest adventure gear store. They usually wear the most expensive trekking shoes and haven’t yet taken the time to break them in, so they may be limping from the blisters that come with new shoes. This is not the way to pack your gear for adventure travel. You should keep in mind that exploration during your holidays is better if you do it in comfort. On your trip you will probably be walking most of the time and it is not easy to walk with 50 kg of luggage in your hand or on your back. Adventure travel may get your cloths dirty and if you are wearing expensive clothing then it may well be ruined. Sometimes there is a chance that your expensive luggage or gear will get stolen in foreign countries. Do you really want to bring an $800 bag? Lightweight backpacks are an ideal bag for any kind of adventure travel, but not all packs are equal. When you buy the backpacks, make sure that you buy dark colored bags and that they have a flap on top. You should pack your cloths in waterproof bags inside of your pack. Try to keep your pack as small as possible, but if you are mountaineering then you will probably need a larger pack to carry your specialized gear. 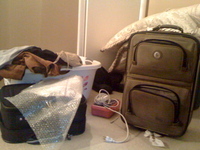 When you are packing, think in terms of the maximum number of combinations for clothing. It’s a good idea to make sure that every shirt you bring can go with every pair of pants. Likewise jackets, dresses, and shoes. It is better to bring several light layers rather than one big heavy coat. That way you can adjust to variable temperatures. In terms of toiletries, these days with the problems associated with airport security, you are better off buying shampoo, toothpaste, and other items when you arrive. Don’t forget to bring an adaptor appropriate for your electronic items and the country you are going to! No matter what kind of travel it is, you should wear light and breathable clothing. Cotton shirts and cargo pants are the most comfortable clothes on any trip. Always wear dark colored cloths on your trip, so that even if it gets dirty it is not so easily visible. You don’t want to get a sun burn all over your body, so make sure you do include sun block and a hat which can protect you from sun. Knives are a no-no. Pick up a cheap knife when you arrive if you really need one. The truth is, you can find most of what you will need wherever it is you are going. A great place to get the specific tips on your particular form of adventure traveling is in magazines related to the particular adventure you are taking.